The roof is going up on our Panthertown project! All the rafters and the ridge beam are recycled barn wood. They say tree house building can be dangerous: hanging from ropes 30 or 40 feet above the ground, maneuvering giant 25-foot beams into trees with nothing more than our ropes to hold them, sliding heavy materials down steep, muddy slopes into gullies, anchoring tall, heavy posts into stones with steel hardware. And then, we have our new friends, like this one. 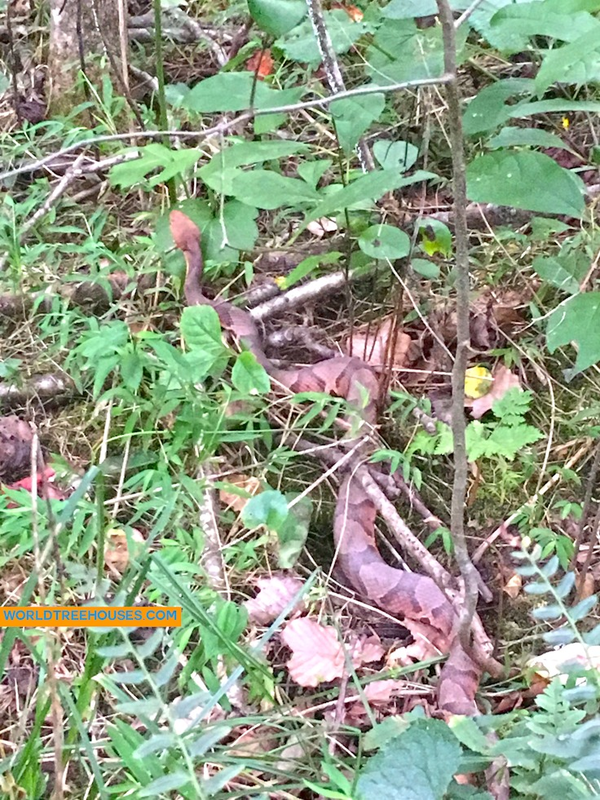 This big, gorgeous copperhead is one of many poisonous snakes we’ve encountered while building our current treehouse in the deep forest in Panthertown. This place is truly wild, and the snakes remind us they are the ones who are really in charge around here! Needless to say, they’ve reminded us to tread lightly.